Your kid has a big enough personality and enough star power to be a modern-day Shirley Temple, so why not let her shine like the celebrity she's destined to be? Well, for one thing, it can be hard to pick out what to wear for such an important task. We totally understand. But luckily, you've landed here. 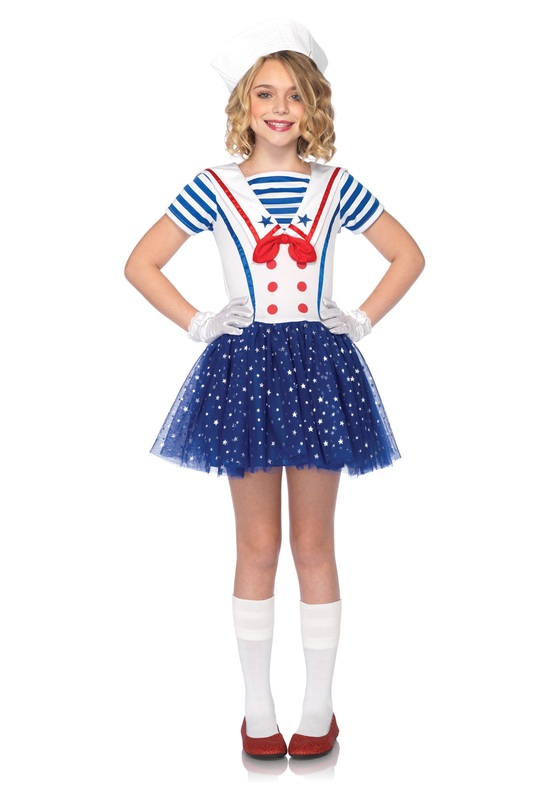 This adorable Child Sailor Sweetie Costume is perfect for your little starlet this Halloween. Because nothing says old-school Hollywood quite like nautically inspired sets and costumes. Just think of all those classic dance numbers with singing screen icons dressed as sailors... and picture your daughter tap-dancing right along with them! This snazzy suit will bring that image to life. It hits on all the classic themes, from the good old American red, white, and blue, to the sailor-style collar and a matching sailor's cap. The skirt comes with a petticoat for a bouncy and lively look and is dotted with little silver stars. The costume truly dazzles the eye, and best of all, it's simple to wear. It's just the dress and the hat -- that's it. So you can be sure your daughter will look great without having to worry about fussing with an overly complicated Halloween costume. Just don't forget to have a look around at our shoes (we recommend red sequins!) and other accessories for the finishing touches. So when your little star dresses up in the Child Sailor Sweetie Costume this Halloween, she's sure to steal the show!